Bright red, medium-size berries are simply loaded with true strawberry flavor! Strong plants are resistant to red stele rot and leaf spot diseases. A real gem! Self-pollinating. Zones 5-8. Fruit: Bright red strawberries. Medium sized fruit. 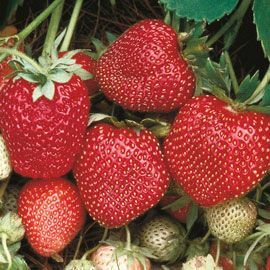 Ordered these last spring and they didn't do much the first year, but as soon as it warmed up this spring, the plants started producing and the strawberries are super sweet.